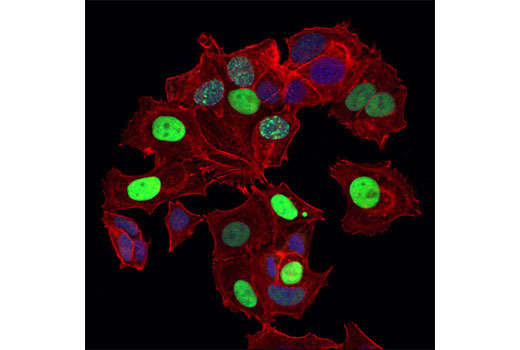 Confocal immunofluorescent analysis of MCF7 cells using p21 Waf1/Cip1 (12D1) Rabbit mAb (Alexa Fluor® 488 Conjugate) (green). Actin filaments were labeled with DY-554 phalloidin (red). Blue pseudocolor = DRAQ5® #4084 (fluorescent DNA dye). Flow cytometric analysis of COS-7 cells using p21 Waf1/Cip1 (12D1) Rabbit mAb (Alexa Fluor® 488 Conjugate). Red=positive cells. 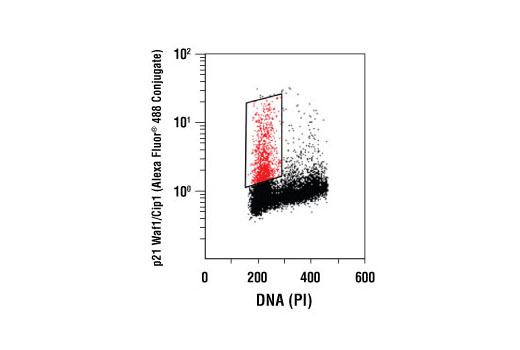 p21 Waf1/Cip1 (12D1) Rabbit mAb (Alexa Fluor® 488 Conjugate) detects endogenous levels of total p21 protein. The antibody does not cross-react with other CDK inhibitors. Monoclonal antibody is produced by immunizing animals with a synthetic peptide corresponding to residues near the carboxy terminus of human p21. This Cell Signaling Technology antibody is conjugated to Alexa Fluor® 488 fluorescent dye and tested in-house for direct flow cytometry and immunofluorescent analysis in monkey cells. The antibody is expected to exhibit the same species cross-reactivity as the unconjugated p21 Waf1/Cip1 (12D1) Rabbit mAb #2947.